which boosts their satisfaction and your travel program’s results. Show your employees a little love – and loyalty – and they’ll show you the same. 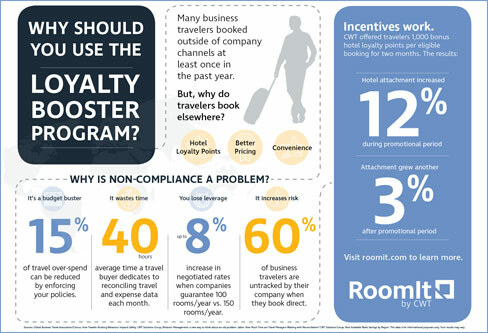 RoomIt by CWT partners with leading hotel chains and airlines to offer exclusive incentives ranging from bonus hotel program loyalty points (Yes, that means extra points on top of those already earned) to airline miles to keep business travelers happy and booking within your program. All at no cost or effort to you. Proof that some corporate travel is more rewarding than others. There aren’t many programs that can win over both travelers and your boss. This is one. You can increase traveler satisfaction and drive in-channel bookings, shift share to preferred suppliers, and improve your negotiation positioning. All leading to lower hotel program costs. Happy boss, check. Happy travelers, check, check.